In Variations in Blue, Amy Klausmeyer’s medium of choice is paper. Using monotype, ephemera, altered images, and handmade papers, she creates mixed media assemblages and collages. 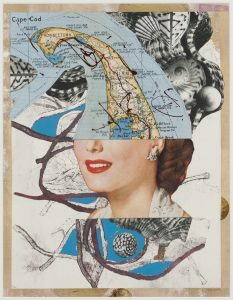 Klausmeyer juxtaposes her modern techniques with vintage images to create pieces that provoke personal reaction and understanding. A native of the Boston area, Amy Klausmeyer earned a BFA in painting/printmaking and has taken classes at the Worcester Art Museum. In addition to ArtsWorcester, she is also a member of the Blackstone Print Studio at the Sprinkler Factory. She has exhibited at locations throughout Central Massachusetts including ArtsWorcester, the Fitchburg Art Museum, Worcester Center for Crafts, and the Sprinkler Factory. An opening reception will take place Tuesday, April 2, 2019 from 6-8 PM. The artist will give a talk that night at 6:30 PM. The artist’s reception is open and free to all. Music is courtesy of Carlos Odria. Parking for the opening and viewing appointments is available in the City’s Federal Square lot, across Main Street from the Hanover Theatre. After the reception, free viewings are by appointment through July 10, 2019. To make an appointment, please contact ArtsWorcester at info@artsworcester.org or 508.755.5142.
image: Place of Dreams, mixed media collage, 16″ x 20″. Check back soon for upcoming exhibitions on view in the Franklin Square Salon Gallery at the Hanover Theatre. The Hanover Theatre for the Performing Arts is Worcester’s venue for Broadway touring companies, national entertainers, and major local events and performances. Visited by more than five thousand guests each year, the historic Franklin Square Salon Gallery at The Hanover Theatre features high ceilings and refined architecture. Exhibitions are celebrated with public opening receptions, after which free private viewings are available by appointment. We are grateful to the Hanover Theatre for continuing to host solo exhibitions of our artists. Opening receptions for ArtsWorcester exhibits at the Hanover take place in the Franklin Square Salon Gallery, on the second floor. They are free and open to the public. To see an exhibit after its opening reception, please contact Arts Worcester. We will gladly arrange for you to visit the exhibit with the artist or an ArtsWorcester staff member. Parking for the Hanover Theatre is available in the Federal Square municipal lot, just across Main Street.